When life hands you lemons...forget lemonade. Reward yourself with a gourmet classic that’ll fill you up, not out. 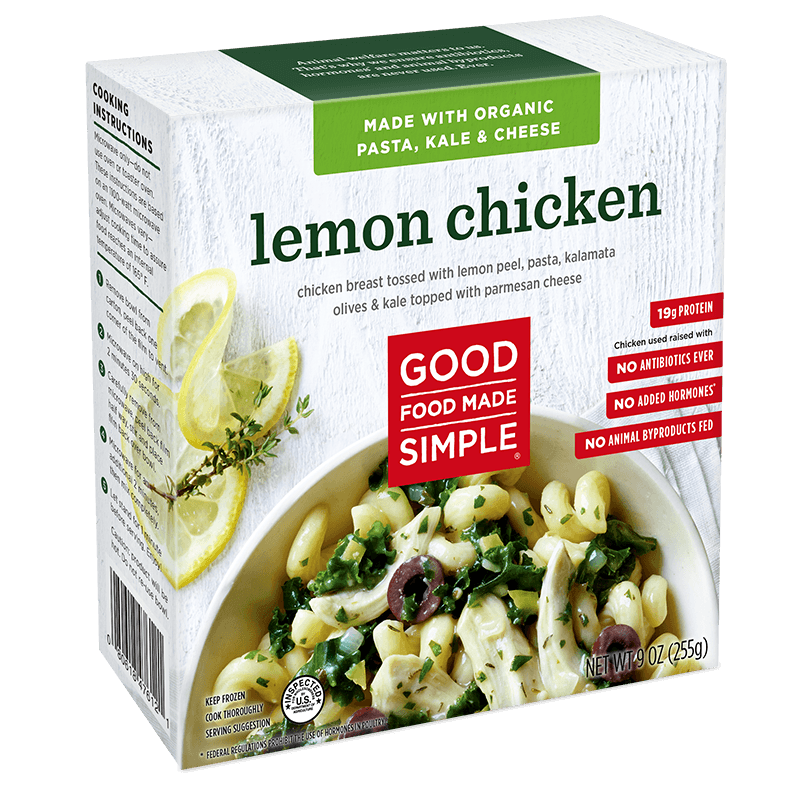 Our Greek style Lemon Chicken is made with tender chicken breast, lemon peel pasta, organic Kalamata olives, organic sautéed kale and topped with freshly shaved parm. COOKED ORGANIC CAVATAPPI (WATER, ORGANIC CAVATAPPI [ORGANIC DURUM WHEAT SEMOLINA]), LEMON SAUCE (WATER, LEMON PEEL [LEMON PEEL, WATER, CITRIC ACID], ORGANIC KALAMATA OLIVES [ORGANIC KALAMATA OLIVES, WATER, SALT, ORGANIC RED WINE VINEGAR, ORGANIC OLIVE OIL], ORGANIC SWEET BUTTER [ORGANIC PASTEURIZED CREAM], ORGANIC CHICKEN BASE [ORGANIC CHICKEN MEAT AND JUICES, SALT, ORGANIC CANE SUGAR, NATURAL FLAVOR, ORGANIC DRIED ONION, ORGANIC POTATO STARCH, ORGANIC DRIED GARLIC, ORGANIC TURMERIC, ORGANIC SPICE EXTRACTIVES], ORGANIC ONION, ORGANIC EXTRA VIRGIN OLIVE OIL, LEMON JUICE [WATER, LEMON JUICE CONCENTRATE, LEMON OIL], SPICES, ORGANIC GARLIC, CORNSTARCH), ORGANIC KALE, COOKED SEASONED CHICKEN (CHICKEN BREAST MEAT WITH RIB MEAT, WATER, LESS THAN 2% POTATO STARCH, SALT, NATURAL FLAVORS, SPICE, LIME OIL), ORGANIC PARMESAN CHEESE (PARMESAN CHEESE [PASTEURIZED ORGANIC MILK, CHEESE CULTURES, SEA SALT, VEGETABLE ENZYMES], ORGANIC POWDERED CELLULOSE [TO PREVENT CAKING]).